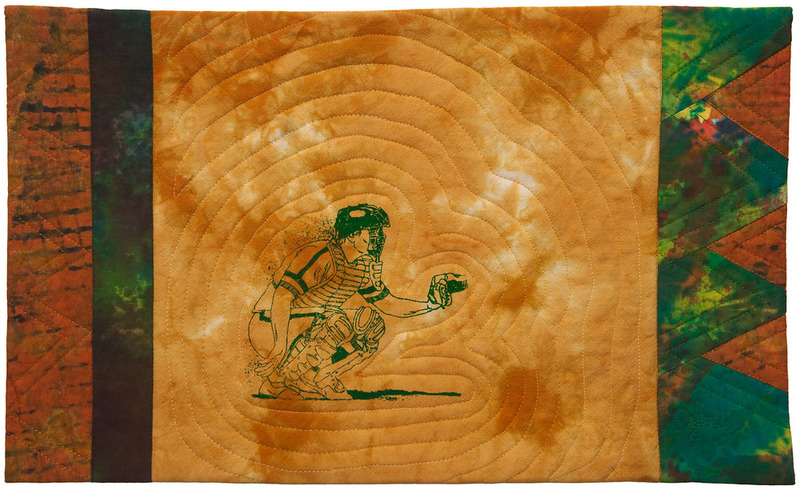 Images of baseball mitts screen printed on various types of man-made leather fabrics are then layered on other types of dye painted cotton fabrics. I grew up listening to Vince Scully on the radio (LA Dodgers). Both my daughters played softball, and I am a long time Oakland Athletics season-ticket holder. When I heard about the WWII Quilt Challenge, this seemed a logical subject fitting my background and experience. I made the home-plate regulation-sized, and screen-printed and hand-appliqued the baseball mitt and ball. The AWSL holds copyrights on most photos and images from the era, so finding this non-AWSL photo was key. I was able to reprint this photo with permission from Melvin Porter, who made it. The following quilts are made with my dye painted and screen printed cotton and linen fabrics, free form cut, machine pieced and machine quilted.